The weather was perfect for a celebration drink at Milion. The prices are a little ridiculous for Argentina, but anything goes in this town where metropolitan chic and the third world collide. Our drinks were around 25 pesos each but it was fun and the atmosphere is unique. 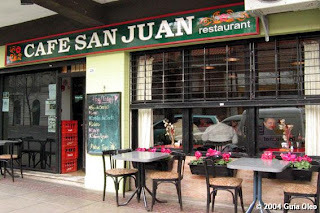 And since we were throwing caution to the wind, we had a late dinner at Cafe San Juan - it looks like a normal bodega but the food will surprise you. Our helpful innkeeper recommended it as a local secret and made our reservations. There are 2 dinner seatings on weekends at (around) 8 and 11. The server presented the chalk board menus at our table and it was a little weird deciding so fast, but there were only a few veggie options so that helped. 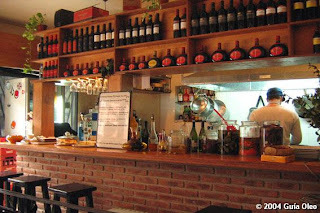 We shared a tapa dish and an entree, as we heard that the portions were large (and pricey) along with a half bottle of wine. I assume that the menu changes daily - we had bruschetta with sun-dried tomatoes and brie (SO much brie!) and crepes with goat cheese and basil in a creamy tomato sauce. Seriously, it was amazingly delicious and plenty for two. So much that I declined dessert, GASP! Since it was sunny, we wondered over to Puerto Madero for a stroll along the river. There's not much else to do since it's an over-planned and under-populated upscale neighborhood but it made for a great walk and we did find Tea Connection, where we enjoyed a couple pots of tea - Indian Chai and Sweet Vanilla, to be exact. And had some time for ring pics. Yay! What a wonderful weekend! You know how very happy I am for you both! Where and when will the wedding be? Mark and I will begin saving up! We wouldn't miss it for the world you know.